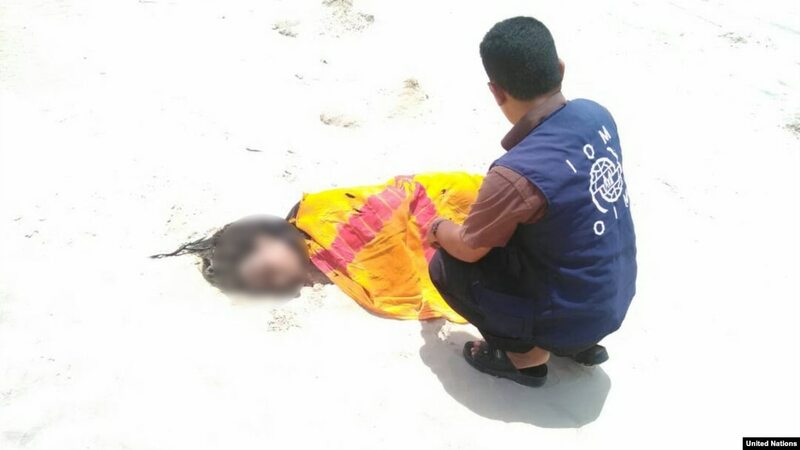 UN Migration Agency staff tend to the remains of a deceased migrant on a beach in Yemen. Despite being seven months pregnant, Mesno Taha left her home in Harerge, Ethiopia to find peace and a better future. She trekked to the Somali zone of Ethiopia, crossed the border into Somalia and paid to board a boat bound for Yemen. After traveling 18 hours at sea, she ended up near the shore of the war-torn country. Taha said that she and over 100 other migrants aboard were told that they had arrived at their destination, despite still being at sea. Armed smugglers forced Taha to jump off the boat into the choppy water while its engine continued to run. In separate incidents on August 8 and 9, smugglers forced about 300 people from their boats as they approached the coast of Shabwa, Yemen on the Arabian Sea. The migrants were from Ethiopia and Somalia. Several dozen migrants drowned and dozens more remain missing. Shortly after the first incident, staff from the U.N.’s International Organization for Migration found shallow graves of 29 migrants on a nearby beach. The smugglers pushed some of them into the sea at gunpoint. Some survivors reported that the smugglers feared being arrested by Yemeni authorities. “If the Yemeni air force sees them, they wouldn’t let them go. So, after they get what they want, they don’t have sympathy for people. They throw people as they wish, like objects,” said Jemal Kebelo Guracha, a witness who spoke to VOA’s Amharic service. Most of the people aboard were children. Sayo Ahmed, a 17-year-old orphan, traveled from Ethiopia and found herself in one of the two boats. Ahmed hadn’t seen her brother for months after Ethiopian authorities arrested him, so she took the risk of fleeing. “I don’t have a father or a mother. I have one brother, and the government took him for participating in protests. We don’t know where he is, and then I gave up and decided to leave my country,” she told VOA’s Afaan Oromoo service. 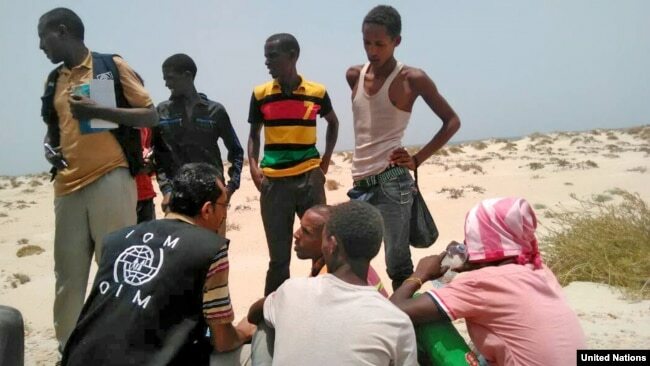 UN Migration Agency staff assist Somali, Ethiopian migrants who were forced into the sea by smugglers. The incidents off the coast of Shabwa illustrate the tactics smugglers use to protect themselves while jeopardizing migrants’ lives. Smugglers use false promises and intimidation to convince refugees and migrants, many of whom are children, to travel in dangerous, unpredictable circumstances. Then, smugglers load them on rickety vessels, often without lifejackets or adequate hydration. Smugglers abuse migrants to maintain control and maximize profits. “People are being abused and raped en route so that their families will pay more…Some people are paying as little as $100 U.S., but then en route they are tortured, they are abused, their families are made aware of this and are forced to pay $1,000 or to $2,000 more,” Headon said. Despite disease, war and famine-like conditions, Yemen has become a popular layover for African migrants traveling to Saudi Arabia and other Gulf states. “When you ask them if they knew that there is war in this country, they say it is better to die traveling instead of sitting where we were,” Guracha said. Last year, more than 117,000 people arrived in Yemen, according to the UNHCR. This year, over 50,000 people, most of whom are children from Ethiopia and Somalia, reached Yemen via the Gulf of Aden or the Red Sea, according to estimates from the IOM. Ethiopian migrants walk after arriving to Yemen’s shore on a smugglers boat in the southern province of Shabwa, Yemen, Aug. 11, 2017. Poverty, famine, conflict, disease and civil unrest force young people in Ethiopia and Somalia from their homes, sometimes at the request of their parents. These parents hope their children can escape, find employment, and send money back home. In other cases, young people’s family members have died or been imprisoned, leaving little reason for them to remain in their homes. Taha said she left her home because her husband is in prison, and she has no children. She said he was jailed during protests by Ethiopia’s Oromo ethnic group advocating for land rights and equal political representation. Those migrants who survived the perilous journey to Yemen looked after one another and buried those who had died. Mohammed Abdiker, IOM’s director of operations and emergencies, wrote about the migrants’ care for one another in a recent post.